On Monday gold futures drifted lower for the fifth straight session in anticipation of an end to the US Federal Reserve's economic stimulus program, slipping back from a six-week high reached a week ago. In afternoon trade on the Comex division of the New York Mercantile Exchange gold for December delivery was changing hands for $1,225.30 an ounce, down $6.50 from Friday's close. The gold market has been unpredictable this month, hitting a high of $1,255 an ounce last Tuesday after a sharp recovery from the 2014 sub-$1,200 low early in October. 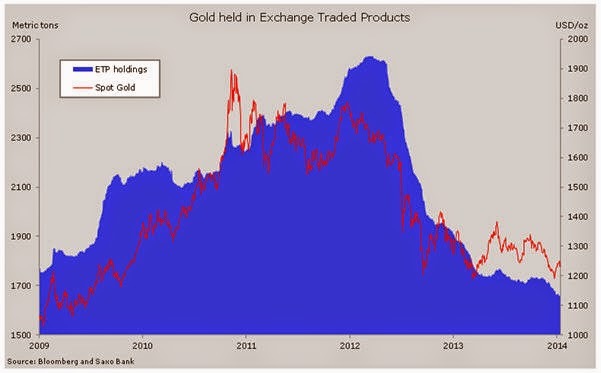 Most large investors and retail buyers have been selling into the rally and the latest weekly data show holdings of exchange traded funds backed by physical gold falling to the lowest in over five years. Net sales of 13 tonnes took total holdings to 1,654.2 tonnes, the emptiest vaults have been since September 2009 when gold was trading below $1,000. Gold bullion holdings hit a record 2,632 tonnes or 93 million ounces in December 2012. Ole Hansen, chief commodity strategist at Denmark's Saxo Bank says "the expectations for a continued rally in the dollar, the ending of QE in the US this week and a benign outlook for inflation have left many investors in doubt about the current upside potential for gold." In the run up to gold's attempt to break resistance at $1,255 on Tuesday last week speculators in gold futures and options turned more bullish. Bullish bets on gold – net long positions held by large investors like hedge funds – jumped some 30% in the week to October 21 according to Commodity Futures Trading Commission data. It was the second time in ten weeks hedge funds added to their bullish positioning after falling to the lowest level this year early October. On a net basis hedge funds held 75,273 gold lots or 7.5 million ounces, still almost half the year high of 14.4 million ounces.